The Farmers Market at 3rd and Fairfax has over 30 food stands. Stall #122 is my favorite. Yes, folks, I like Singapore's Banana Leaf more than Loteria Grill. I've eaten here many times and have yet to be disappointed by anything! 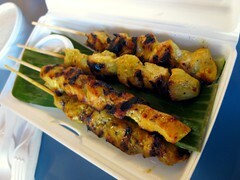 Among my faves are the rendang beef ($9.45), curry puff ($1.50), and satay chicken ($8.95). It's not the cheapest or the fastest eatery at 3rd and Fairfax. What do you think? What's your favorite place at The Farmers Market? Never had a curry puff, but it sounds good! We don't have places like this in OC that I know of, you're lucky. man, haven't been back there in ages. i always eat at loteria and then pick up some toffee at little john's. i will check this place out next time. 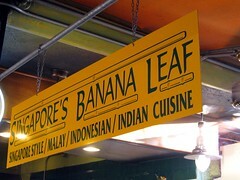 I grew up in Singapore (not a native, though) and I have to say...not a fan of Banana Leaf. 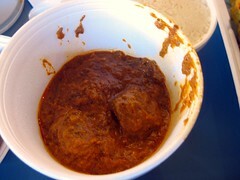 The taste is muted and watered down for me, compared to the real Singaporean food I love and crave. 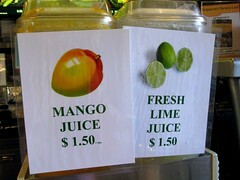 Fresh lime juice sounds really good. 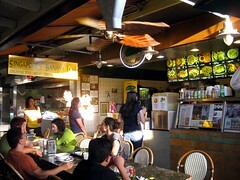 I like Singapore Banana Leaf, the Brazilian Place, Moishe's. It's all good. I like Singapore's Banana Leaf. And the Gumbo Pot too! i see you've gone the collage route! isn't it great?! 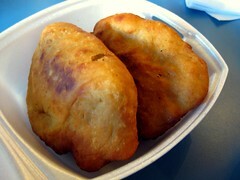 i want to try a curry puff! i am in such a rut when it comes to eating at the farmers market: magee's corned beef & cabbage plate, every. single. time. I almost always end up at the Gumbo Pot. So so good.